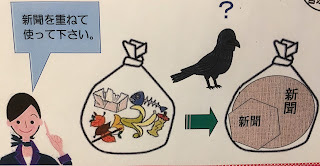 Instances of one or a group of giant-sized crows (karasu) spreading garbage across the street has become a real social nuisance in Japan in recent years. Blue or yellow nets have become a necessity but as the picture shows these are often not enough. In my own "mansion" (apartment) residents are instructed to wrap their garbage in newspaper (below) to confuse the crows and this is actually effective - if everybody complies. But crows do not only make a mess - there have been cases of them attacking humans and even causing blackouts by building nests on top of transformers. Historically, crows hold a special place in Shinto as epitomised by Yatagarasu, a giant crow-god who sometimes appears in three-legged form, a creature common in ancient Asian mythology. Even today, the Japan Football Association's emblem is the three-legged crow. One of Japan's most famous children songs Nanatsu no Ko (Seven Baby Crows) highlights the mother crow's love for her cute children, perhaps one reason the song is used as the neighbourhood chime to encourage children to return home to the safety of their parents (see this post).